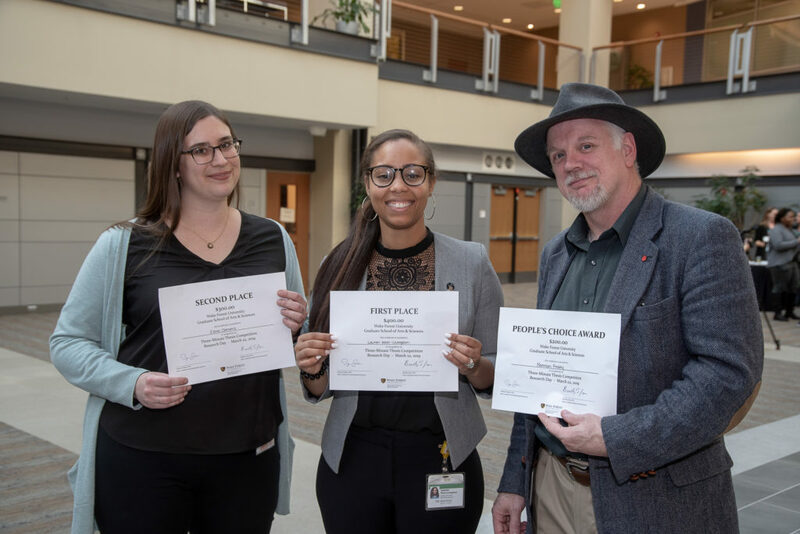 On Friday, March 22, 2019, over 100 graduate students and postdoctoral fellows at Wake Forest University Graduate School of Arts & Sciences presented their research projects via poster presentations and a Three-Minute Thesis competition. Research presentations spanned WFU’s 30+ graduate programs including biomedical research, liberal arts, social sciences, and basic science. Wake Forest faculty, students, and the surrounding community attended the event and learned about the Graduate School’s vital role as an engine of discovery that fuels the nation’s scholarly and creative enterprise. Three Minute Thesis (3MT™) is a skills development activity that challenges higher degree students to explain their research project to a non-specialist audience in just three minutes. Ten finalists were selected to compete on Research Day – 5 students from the Reynolda campus graduate programs and 5 students from the Bowman Gray campus graduate programs. View the Research Day Highlights and 3MT Competition Playlist produced by the Documentary Film Program.